GST is the principal tax-related reform in the country bringing equality in the taxation structure and eliminating the cascading of taxes that were levied in the past. 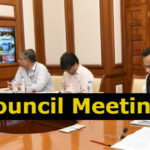 The GST Council meets from time to time to revise the GST rates for various products. Several states and industries recommend reduction in GST tax rate for various items which are discussed in these meetings. 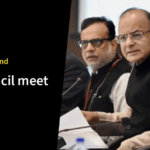 Finance Minister Arun Jaitley said that the government wanted to keep the GST rates close to the original rates. But there were differences in case of some items because of the changes in the economy as well as customer preferences. Some commodities were kept in the high tax bracket (18-28%) but on scrutinize the list, they found that these commodities should be considered as necessities and not luxuries. 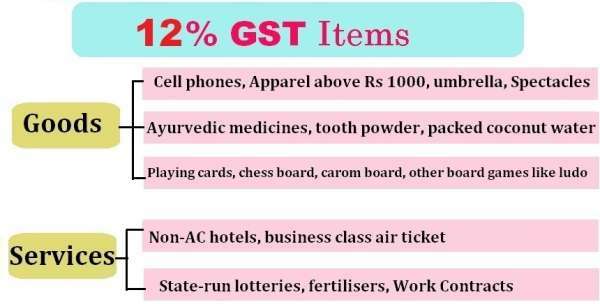 This is why the GST rates were revised for commodities such as notebooks, exercise books, spectacles and lenses and some other items. Luxury items such as small cars, consumer durables like AC and Refrigerators, premium cars, cigarettes and aerated drinks, High-end motorcycles are included here. The government has proposed a 4-tier tax structure for all goods and services under the slabs- 5%, 12%, 18% and 28%. After the recent revision of GST rates, these are the commodities that fall under the four tax slabs along with those that do not attract any tax. Please note that only those commodities are included in this list whose rates have been revised in various council meetings. With the implementation of GST, there will be no tax for the following goods as well as services throughout India. Unpacked foodgrains, fresh vegetables and fruits, unbranded atta, maida, besan, gur, milk, eggs, curd, lassi, unpacked paneer, unbranded natural honey, palmyra jaggery, all types of salt, fresh meat, fish, chicken, buttermilk, cereal grains hulled, Jute, flour, bread, prasad, bindi, sindoor, stamps, judicial papers, printed books, newspapers, bangles, handloom, Bones and horn cores, bone grist, bone meal, etc;, hoof meal, Kajal, Children’s’ picture, drawing or colouring books, Human hair. Under GST, all hotels and lodges in India with tariff below Rs.1,000 are exempted from paying taxes. Rough precious and semi-precious stones will be taxed at 0.25% all over India. Apparel below Rs 1000, footwear below Rs 500, Sugar, tea, roasted coffee beans, edible oils, cream, skimmed milk powder, fish fillet, branded paneer, frozen vegetables, coffee, spices, pizza bread, rusk, sabudana, kerosene, coal, medicines, stent, lifeboats, Cashew nut, Cashew nut in shell, Raisin, Ice and snow, Biogas, Insulin, Agarbatti, Kites, Postage or revenue stamps, stamp-postmarks, first-day covers. Transport services (Railways, air transport), small restaurants. Cell phones, Apparel above Rs 1000, sewing machine, umbrella, Ayurvedic medicines, tooth powder, Butter, ghee, almonds, fruit juice, packed coconut water, preparations of vegetables, fruits, nuts or other parts of plants including pickle, murabba, chutney, jam, jelly, bhujia, namkeen, fruit juices, frozen meat products, dry fruits in packaged form, animal fat and sausage, cheese, colouring books, picture books, Ketchup & Sauces, All diagnostic kits and reagents, Exercise books and notebooks, Spoons, forks, ladles, skimmers, cake servers, fish knives, tongs, Spectacles, corrective, Playing cards, chess board, carom board and other board games like ludo. Non-AC hotels, business class air ticket, State-run lotteries, fertilisers, Work Contracts. Footwear above Rs.500, camera, speakers and monitors, Headgear and parts thereof, Trademarks, goodwill, software, Bidi Patta, Biscuits – All categories, flavoured refined sugar, pasta, cornflakes, pastries and cakes, preserved vegetables, jams, sauces, soups, ice cream, instant food mixes, mineral water, tissues, envelopes, tampons, notebooks, steel products, printed circuits, Kajal pencil sticks, Aluminium foil, Weighing Machinery [other than electric or electronic weighing machine]. Printers [other than multifunction printers], Electrical Transformer, CCTV, Optical Fiber, Bamboo furniture, Swimming pools and paddling pools, Curry paste; mayonnaise and salad dressings; mixed condiments and mixed seasonings. AC hotels that serve liquor, telecom services, IT services, branded garments and financial services, Room tariffs between Rs. 2,500 and Rs. 7,500, Restaurants inside five-star hotels. Automobiles, Motorcycles, ATM, washing machine, shavers, hair clippers, Bidis, chewing gum, molasses, chocolate not containing cocoa, waffles and wafers coated with chocolate, pan masala, aerated water, paint, deodorants, shaving creams, after shave, hair shampoo, dye, sunscreen, wallpaper, ceramic tiles, water heater, dishwasher, weighing machine, vending machines, vacuum cleaner, aircraft for personal use. Cinema, 5-star hotels, Private-run lotteries authorised by the states, hotels with room tariffs above Rs 7,500, race club betting. The government has also impose GST on Services with the same 4-tier tax structure as of goods. GST rates on services comprising of 5%, 12%, 18% and 28% come with various pros and cons for the consumers. However, the government has exempted healthcare and educational services from the purview of the GST. Subsequent to bringing cars under the GST regime, the GST rate on cars has been fixed at 28% for all personal use vehicles featuring a petrol or diesel driven engine. However, in addition to GST, a composition cess is also applicable to cars over and above the GST Rate. Thus the overall tax rate applicable to vehicles under GST ranges from 29% to 50%. Lower rates of taxation are however applicable to cars driven by cleaner technologies such as fuel cells (including hydrogen fuel cell) and electric vehicles. Subsequent to the introduction of GST on items made from gold such as gold jewellery, the current GST rate on gold is 3%. However, a 5% GST rate is applicable to making charges applied to gold jewellery in case the manufacturing is outsourced to a job worker. This can, however, be charged as an input tax credit (ITC) by the jeweller and only a 3% GST charge is applied to the final bill paid by the purchaser of gold jewellery items. GST is applicable to real estate purchases only if you are purchasing an under construction property. The GST rate applicable to such transactions is 12%. No GST is applicable in case you are purchasing a ready to move in property. Additionally, different GST rates are applicable to various building materials used in the construction of houses/flats. This can range from 5% (sand, marble rubble, etc.) to 28% (cement, etc.). Food items especially fresh food mostly carry a Nil GST rate. However, packaged foodstuff and semi-processed/processed foods do feature GST rates starting from 5% up to 18%. While no foodstuff are currently included in the highest 28% GST bracket, the 18% rate of GST is applicable to some common food products such as chocolates as well as baked goods such as cakes. 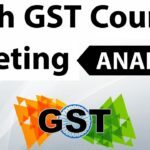 Increase in Competition: After the GST has been imposed, there has been seen a fall in prices of goods and services which ultimately has brought the final consumer to have less tax burden on the goods and services. There is seen a great scope of increased production, thus, increase in competition. Simple Tax Structure: GST has simplified the calculation of tax with the adoption of a single taxation system. Under this, multiple taxations have been aborted which ultimately saves time and money. Uniform Tax Regime: Previously, there used to be multiple taxes at every stage of the supply chain, where the taxpayer got confused. But now, with GST, it is easier for the taxpayer to pay a uniform tax. Increase in Exports: There has been seen a fall in the cost of production after the GST got imposed. This in return has brought competitiveness towards the international market resulting in rising in exports. 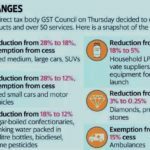 Latest GST Rule Updates: What Got Changed?